Across the globe, wetlands are disappearing. Aquifers, rivers and lakes are drying up or becoming too polluted to use. As a result of this stress on the world’s water systems, 2.7 billion people find water scarce at least one month out of the year. However, solar energy may now offer a new way to conserve water to keep ecosystems thriving and help humans meet this basic need. While many are aware of reduction in greenhouse gas emissions as a benefit of renewable energy, the World Resources Institute now finds that the switch to solar energy from fossil fuel electricity generation can also help save water. According to the Virginia Water Resources Research Center, if electricity is supplied from a power plant, it takes 3,000-6,000 gallons of water over the course of a year to power just one incandescent light bulb for twelve hours per day. Whereas fossil fuel power plants use water in the cooling process, solar panels require virtually no water to run or maintain. This finding is particularly relevant in the Middle East and North Africa, which have abundant solar resources and face scarce water supplies. Saudi Arabia, which is one of the world’s largest exporters of oil, recently announced plans to build the world’s largest solar project by 2030. The 200 GW project would cut electricity costs by $40 billion and create 100,000 jobs. However, Saudi Arabia has announced other renewable energy investment targets, such as plans for 24 GW of solar by 2020, in the past decade that have yet to fully materialize. Whether Saudi Arabia will be successful in implementing the world’s largest solar project remains to be seen. For solar to become an effective tool to help nations cope with water scarcity, new solar projects must first be approved. 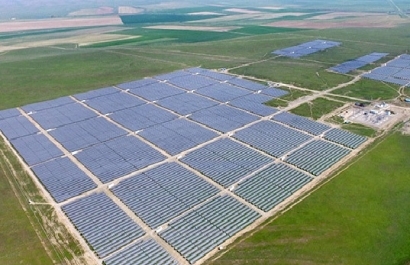 Companies must ensure that solar power’s positive attributes, such as water conservation and economic benefits, shine through to receive the stamp of approval needed to build these new solar farms. Opponents will waste no time coming out against the aesthetic, home value and wildlife impacts they claim a solar project will bring. Solar companies must define a clear message from the earliest stages of the planning process and execute effective ways to spread the word. Hold a community open house to introduce the solar proposal and receive feedback. This format allows residents to circulate among stations dedicated to key facets of the proposal. Provide handouts, display visuals, and engage experts to answer questions. A community open house should also promote resources such as a project-specific website and social media accounts that residents can visit after the event for updates. Partnering with stakeholders in support of the solar project can help add legitimacy to messaging, raise awareness of digital resources and loop supporters into the grassroots effort from the start. In the United States, the average adult spends a total of 5 hours and 42 minutes on digital media activities each day, according to EMarketer. As a result, every new solar proposal is worthy of a dedicated project website as well as its own Facebook, Twitter and/or YouTube channel, at the very least. So, the project’s digital platforms have been created, but how can solar developers grow their audience? Organic reach occurs when social media users share or engage with good content. Create interesting graphics, find research or articles to back up messaging with statistics and post videos related to the project that residents will not hesitate to share. By boosting this content with a paid ad, it is possible to guarantee increased reach to social media users within a particular community or neighborhood at a low cost. Campaigns can be customized for any budget on social media. Additionally, display ads on local daily or weekly newspaper websites that are frequented by members of a target audience will also help generate website traffic and expand reach to those who matter most. More sophisticated display ad campaigns can deliver impressions to internet users surfing websites beyond the local daily or weekly paper by drawing upon the Google Network to geotarget ads to residents as they browse any one of the thousands of news, entertainment, shopping or lifestyle websites that show ads. Display ad campaigns can even re-target ads to people who have visited the project website by serving an ad reminding them to complete the call to action once they have left the site. Is the media strategy defined? Do not wait until an article reporting on the protests about the solar project is published to respond. Set up editorial board meetings to take place as soon as the application is officially submitted, and invite reporters to the initial open house as a briefing. Creating an open dialogue with reporters will help make sure they reach out for comment any time an article is in progress. Share updates with reporters, and direct them to supporters and stakeholders willing to be quoted as an advocate of the proposal. Without a clear media strategy, projects risk being portrayed as unbalanced with far more opposition than support. Will supporters go to bat for us? The only way to convert a silent majority to a supportive majority is to ask residents to get involved. Create a pathway for people to get involved at any level, from active to more passive activity. An action can be as simple as sharing a post to help others learn about project resources, to something as time consuming as attending a public hearing. No matter what level of commitment a call to action takes, supporters will not get involved if they are not asked. The factor that makes the difference in any solar permitting process is identifying real residents willing to speak at hearings, write letters, sign petitions, display lawn signs and show support! Most importantly, public officials should be updated regularly on supporter engagement. One way to do this is to create a portal on the project website that makes it easy for supporters to sign on to a form letter that is forwarded as an individual email to public officials on the supporter’s behalf. This keeps the issue at the top of officials’ inboxes and supporters on the forefront of project communications. Al Maiorino started Public Strategy Group, Inc. in 1995. His firm has developed and managed multiple corporate public affairs campaigns in a variety of industries such as gaming, cable television, retail development, auto racing, energy and residential projects. Additionally, his firm has worked on projects in twenty states and three countries. Humans discovered fire. We invented a lot of technologies to make fire more useful. The whole world operates on the concept of burning everything in sight. Humans need to get away from this trend very quickly. The designs are very inefficient and they are non renewable. With enough electricity we can build and do anything we just can keep juicing the system with more dirty fuel. Right now all the power plants could not power a world full of electricity. Right now we are powering the world off of pistons and turbines that mix carbon with oxygen. Pretty amazing things have come from such an old barbaric technology. Humans can do a hell of a lot better. We got too the moon and mars, and everything that we have done from two sticks being rubbed together. In Saudi Arabia and other Islamic countries, millions of gallons of water are wasted every day in the Hamams (ablution areas) next to the mosques. Muslim men take, essentially, 5 mini-showers / baths a day when they engage in Islamic ablution and this water goes straight into the sewer. Used ablution water should be collected in cisterns and reused to flush the toilets in the hamams.